I was talking with a friend today about a big dream of mine, one that I have been scared to admit to having. Have you ever felt that way, that your dreams terrify you? Mom blogger Julie Nowell recently wrote about that stomach plunge feeling when you start on a new dream, as she just launched her own consulting company. "Simply put . . . maybe I am focusing on what I do best . . . even if what I do best scares the crap out of me. Perhaps I am best when I am terrified? Perhaps that is how I know I am on the right track?" And I know what she means. Sometimes we don't know what those big dreams really are, until our whole body is vibrating with fear but also a giant YES! It's confusing, but exciting. And I don't know how long it will take to manifest this dream, if ever... But I'm going to post it here, my big dream. I want to license my Princess Monsters, and see them travel the world on cards, t-shirts, stationary, and a million other things. And that's a pie-in-the-sky dream, but I'm going to let myself have it anyway. Go big or go home, right? 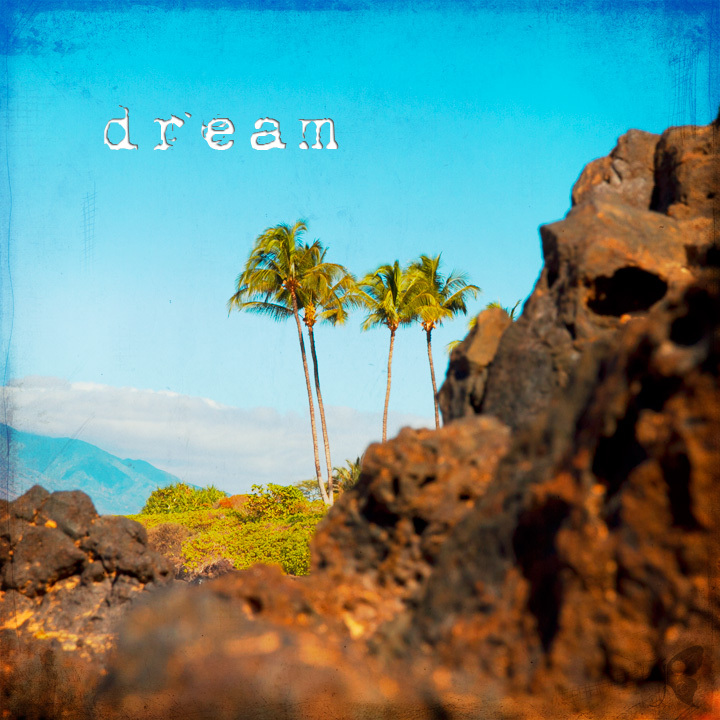 Do you have any big dreams you are holding onto, afraid to say it out loud? Give it a try today, and see how it feels. Today's photo was taken in Maui on vacation one year ago, when I was very pregnant and very uncomfortable. I'm so happy to have this baby on the outside! The photo was layered with the texture Be Still from Kim Klassen, and I am linking up with Kim's Texture Tuesday today. Beautiful, especially on this winter day. I was on FB yesterday for a moment just after 2 pm, long enough to take a gulp of coffee before heading back down to my studio. I popped onto Kelly Rae's live FB comment feed and there was your comment/question. I don't know whether she answered your question as I didn't stick around long enough but I felt I should say, don't let how others may interpret your art stifle your creativity...ever. Create what is in your heart and it will translate. Someone once told me that "creating art that looks child-like as an adult is one of the hardest things to do." So, just know you are creating beautiful art from a great place...from within you and keep dreaming and creating! Thanks Kathleen! Yes, she did answer, and I am writing a post about that right now. It was such a great experience. And thank you for your kind words. I am finding my way in this world of art, and loving all the amazing supportive people I meet along the way. This is a great shot to depict Dream! I love the solitary, spindly palm trees against the endless blue sky. It reminds me to always reach out and up for my dreams! I love your big dream. And I know that excited / scared / electrified feeling well. I think it's how you know that you're really on the right track.